1960 was an eventful year in the United States. The laser was invented, Joseph Bellino won the Heisman Trophy, and a new company called Brightwood Corporation was started in an old three-walled lumber planer mill in Madras, Oregon with an $18,000 investment by Carl Peterson, Ken Stovall, and Jack Stockton. Innovation was an early watchword for Brightwood. Instead of hand-stacking its wood products on rail cars, the new company used palletized units to save time. 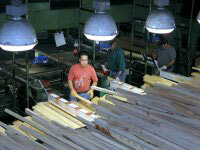 A profit-sharing plan was set up for employees, something seldom available in the wood products industry at that time. College scholarship programs were also instituted for the children of workers. In 1978, Ken purchased the majority of the company and changed the name from Brightwood to Bright Wood. Continuing to think outside the box, in the 1980s Ken went overseas to Chile and New Zealand to obtain supplies of radiata pine to augment the shrinking U.S. pine supply. Over the past decade, the company has used its innovative management style to become more of an engineered wood products company, wrapping low-cost finger jointed wood profiles with vinyl and wood veneer, allowing it to reduce the use of clear wood. In 1997, the use of sophisticated scanners, cameras, computers, and software to maximize lumber yields earned Bright Wood recognition from the Smithsonian with an award for “visionary use of information technology in the field of environment, energy, and agriculture.” This focus on yield in both its rough cutting programs and downstream operations have also reduced costs and streamlined production, allowing Bright Wood to save customers over $10 million through product re-engineering alone, all of which positions the company to come out of the current housing slump stronger than ever. In early 1991, Ken Stovall embarked on the effort of Total Quality Management (TQM) to expand the processes of continuous improvement in order to drive the company into the future after his retirement. Each production plant is audited at least annually in accordance with ISO 9001:2008 requirements and the audit results are maintained in an electronic database, available for review upon request. New product roll-outs involve two critical processes often required by many customers: a Production Part Approval Process (PPAP) and Failure Modes and Effects Analysis (FMEA). Both have become valuable proofing tools to streamline new product rollouts. “We have a series of auditors in the Quality Department who do rounds through each one of our plants, checking product and process compliance quality, including preserving samples of the outbound products. Quality also performs process control audits to verify that checks are being done at required intervals and that all process controls are being performed as required on the shop floor,” he added. Practices like these have earned Bright Wood a Window and Door Manufacturing Association’s (WDMA) Hallmark Certification for laminated, finger jointed, and preservative-treated products. As part of that certification, Bright Wood has to allow audits of their production processes. “We are FSC [Forest Stewardship Council] controlled wood certified as well,” Stovall added. This is a stringent certification that, for the past 20 years, has aimed to meet the current need for forest products without compromising the health of the world’s forests for future generations. Before timber leaves New Zealand for the Bright Wood mill in Oregon, it is kiln-dried. Why the focus on wood moisture? “Gluing it, laminating, finger jointing can all be affected by moisture content,” Schierling added. However, there is a more serious problem caused by incorrect wood moisture content. Looking at a chart of Atmospheric Moisture Averages (AMA) for Minneapolis, Minnesota, which reflects much of the climate of most of Bright Wood customers, the city can experience an AMA of between 11.9% and 14.6%, depending on the month. The AMA in Madras, Oregon, where Bright Wood is located, can range between 7.4% and 16.5% during the year. But how does that affect the actual dimensions of the wood? Using a dimensional change coefficient formula with ponderosa pine, for instance, shows that with only a 3% differential in wood moisture content on a 2” wide part there can be a variance of as much as 0.00798” in radial shrinkage and 0.01296” in tangential shrinkage, which puts it perilously close to the customer’s dimensional tolerance range. Small differences can add up to big headaches for Bright Wood. 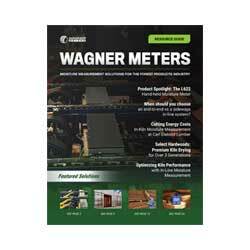 “Scott maintains our database, which documents all corporate calibration, including verifying all the calibrated tools on the shop floor, including the Wagner moisture meters,” Stovall added. Even though Bright Wood is already one of the world’s largest manufacturers of wood components and millwork, it isn’t resting on its laurels. It continues to develop new sources of timber and adds more facilities to service the market. “Bright Wood has a sawmill in New Zealand, but we also buy timber from other sawmills there,” said Burson. Quality product as a result of quality processes overseen by a top-notch quality control team will continue to be the centerpiece of the family-owned business, which prides itself on its record of quality, innovation, on-time delivery, and total dedication to customers and suppliers.